I’m glad I’m an early riser. At 6am on this beautiful mid-May Sunday morning, therefore, I grabbed a mug of tea and my camera bag and headed west into the cool, slightly foggy Vermont. A few minutes later I pulled into the tiny Post Mills Airport just as the first balloons were about to launch, as part of the Experimental Balloon and Airship Meet. What a treat! 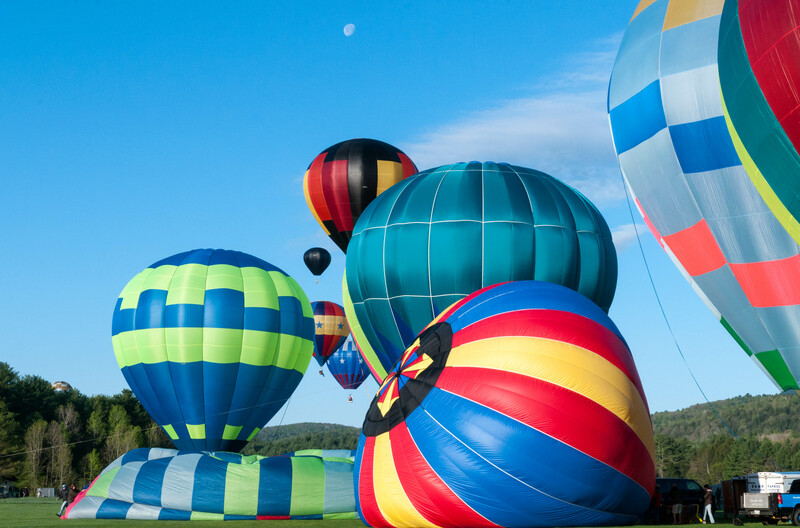 Deep blue sky, a slight breeze, and happy faces all around as more than two dozen balloons were unfurled, inflated, and launched into the Vermont morning, slowly drifting east. I topped it all off with a wonderful pancake breakfast from Revels North. Great start to a beautiful day!